“I’ll just go ahead and confess up front that the reason I bought the book was for the journal pages. I came to love the journal pages because I took the time to read the book. Gina Duke has seriously taught me so much in a very few pages of text, considering how many books have been written on the subject, and not just about prayer. She has a gentle, humble spirit and a clear method of showing us how to deepen and grow in our prayer life. “Prayer can be confusing at times. Some people keep journals, some people follow scripted prayers. But is there a correct way to pray? Is there a way to pray that truly connects us to God? The author has done an amazing job of simplifying the process of prayer journaling while showing the reader how to grow closer to God through prayer. 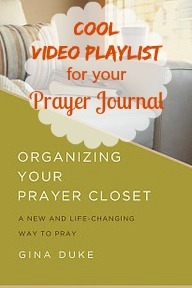 “Organizing Your Prayer Closet: A New and Life-Changing Way to Pray by Gina Duke is a guide for helping a person’s prayer life. Each chapter is aimed at a different part of a prayer life, from “Praise and Thanksgiving”, “At the Right Time”, “Faith and Follow-Through”, plus seven more. 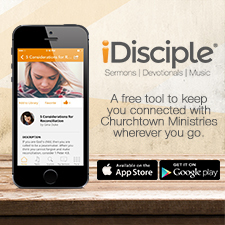 Each chapter is followed by instruction and examples on how to fill out a prayer journal, plus there are sample prayer journal pages in the back. 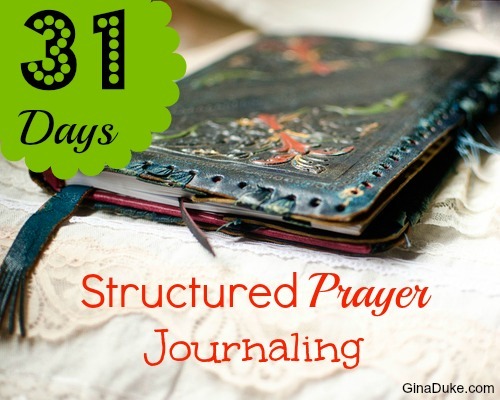 By using the journal each person is able to see how God works through their prayer petitions.